Born in Wolfsburg, Germany, Hans spent his National Service in France caring for severely disabled children, before settling in the UK to study at the British School of Osteopathy. He graduated in 2015, before coming to work at the Ebrook Osteopathy and Sports Clinic in 2016. He is an excellent diagnostician, able to give patients relatable explanations of his Osteopathic work, and a clear timeline for their return to health. 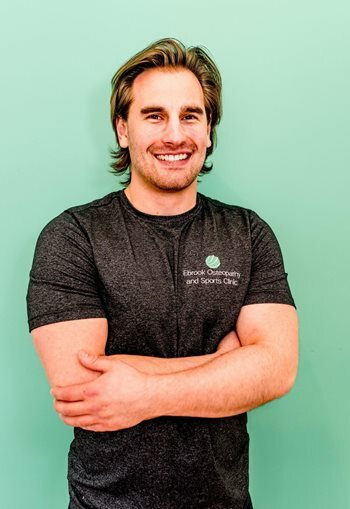 During his time at the British School of Osteopathy, Hans worked on their OsteoMap programme – a specialist clinic designed to gather information on how Osteopathy can help those suffering from chronic pain conditions. His work there has given him a great understanding of conditions such as ME, Chronic Fatigue and Fibromyalgia – and enhances his treatment programmes for those with chronic systemic conditions. Hans’ love for research has continued as his career progresses. He’s currently looking into starting up new biomechanical research projects in the West Midlands area. Hans has a great love for sports requiring an extra element of skill and precision – table tennis and archery among them – which reflects in his finer approach to osteopathic technique.